J. League Pro Striker (Ｊリーグプロストライカー) is a 1993 football game for the Sega Mega Drive by Sega. It was the first in a long line of J. League games developed by Sega after acquiring the license to the franchise for their consoles (but it was not the first J. League game on a Sega system — Game Arts's J. League Champion Soccer, released a few months earlier on the MD, was). J. 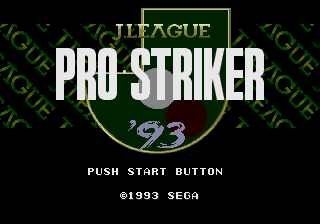 League Pro Striker was originally launched on April 23, 1993, however a bug caused these initial copies of the game to recalled. A modified version was released on June 18, 1993. Incidentally this was the first year of the J.League's existence, so is, by extension, one of the first J.League-branded video games. The game was followed by J. League Pro Striker Perfect and later J. League Pro Striker 2. Special Thanks: Kyamura, K.Fuzzy, Chaff, Shinyuu, Sunset, Saru Man, Hinappy, Yoisyo, Liddle, Resort Master, ROULY·S·KINE, SHIGE. D.O.R. Main article: J. League Pro Striker/Magazine articles.